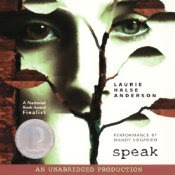 Speak by Laurie Halse Anderson, read by Mandy Siegfried. Grades 9+ Listening Library, 2000. 5 hours, 2 minutes. Audiobook provided by my local library. It's Melinda's freshman year and it's not going well. She's flunking all her classes except art. Everyone hates her because she called the cops at that party. But they don't know the truth about what happened that night. Melinda has a secret. One she can't ever tell anyone. Last year, Speak was challenged and KidLit folks and bloggers responded with the #SpeakLoudly campaign, speaking out in support of books that tackle difficult issues for teens. This is such an important book. I can't even tell you. It breaks my heart to think about how many teens are going through something just like Melinda. Something terrible's happened to them and they feel like they have nowhere to go. They feel like no one will listen to them or believe them, and so they stay silent. And no one has any idea. I have no doubt in my mind that there's a need for Speak and books like it on library shelves. I don't feel like I can review this book, even. It's a modern classic and winner of a Printz honor. If you haven't read it and you like YA lit or you like teenagers or you want to consider yourself well-read, I must insist that you read it. What I can tell you is that the audio recording is fabulous. I read the book when I was in college for a YA Lit class and, as I am wont to do, I "reread" via the audio recording. It was an impulse library checkout, actually, but I'm so happy I randomly picked it up! Mandy Siegfried is a perfect fit for Melinda. Her voice sounds believably young, but not annoying in that way that adults trying to sound like kids can sound. She has nice pacing, not too fast or too slow, and she reads clearly. The narration's not voiced, but it's not the kind of story that calls for voices. A straight reading makes it seem like it's actually Melinda telling you the story. First-person narration lends itself to the audio format anyway, but Ms. Siegfried simply becomes Melinda, making the story all the more heartbreaking. Speak is on shelves now! Hey, I'm an Audible affiliate, so if you purchase stuff after clicking the links on my site, I get a small commission.